LT house is an example of Vietnamese studio Tropical Space’s affordable homes. Tropical Space’s LT house in the Long Thanh district of Dong Nai province, in Vietnam, centres around the dichotomy of public and private space. 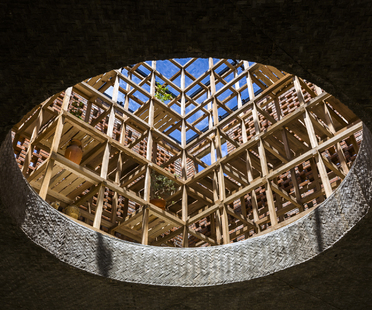 The architects of Tropical Space designed Terra Cotta Studio on the banks of the Thu Bon River, in Dien Phuong, Vietnam: a brick cube concealing a wooden core which is the workshop and museum of terra cotta artist Le Duc Ha. Tropical Space has made the building a symbol of the local tradition of ceramics. Built by Architetti Riuniti-Archinside-Studio Rosselli of Genoa, this is one of the first works by Italian architects in Vietnam or indeed anywhere in southeast Asia.